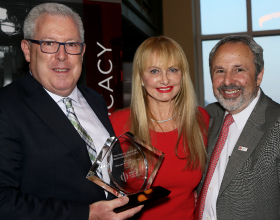 Respiratory Health Association awards the inaugural Solovy Award for Advancement in COPD to Malcolm M. DeCamp, MD, chief of the Division of Thoracic Surgery at Northwestern Memorial Hospital on June 23, 2015. Recognizing his leadership in COPD treatment, RHA provided Dr. DeCamp with a $10,000 research gift to be used for further advancements in fighting the disease. This award is made possible by the Kathleen Hart Solovy and Jerold S. Solovy Endowment for COPD, created in the spring of 2015 at RHA. Jerold Solovy, former chair emeritus of the Jenner & Block law firm in Chicago, was one of the estimated 1 million individuals in Illinois living with COPD. Kathleen Hart Solovy established the fund in his memory.